Our students and guests arriving and enjoying refreshments. Anderson Strathern; Ashurst; Brodies; Beltrami & Co; BLM; BTO; Cloch Solicitors; Eden Scott Recruitment; Ellis Whittam; Hymans Robertson; Katani & Co; Kerr Brown; KPMG; Latta Law; Leslie Wolfson; Livingstone Brown; MacRoberts; Paul Hannah Solicitors; Peacock Johnston; Shepherd and Wedderburn; SYLA; Thompsons and Whyte & Mackay. 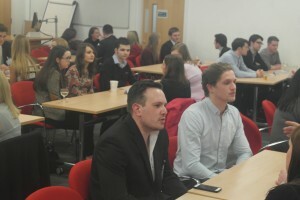 There was a variety of guests differing in both the sectors they work in and the roles they perform. 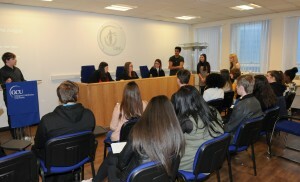 This unique opportunity to hear from experienced solicitors and trainees about their experiences in the profession, securing jobs within it and lessons they learned along the way was invaluable for all our students, particularly those about to embark upon the same journey. 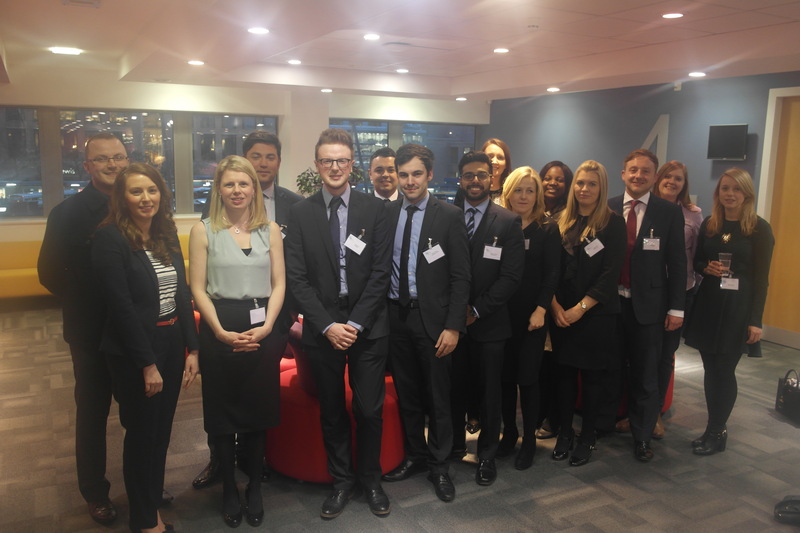 We were fortunate to have representatives from companies such as KPMG and Ashurst to give our students an insight into the varying career paths you can go down when equipped with a law degree. 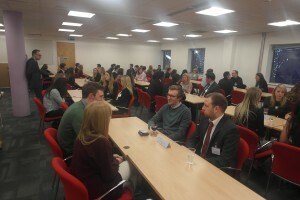 Since it was very effective last year, the evening was once again styled as a ‘Speed Networking Evening’, using a speed dating format to ensure that all of our students had the chance to speak to each of the guests. Between 6pm and 8pm, a buzzer would ring after each 5-minute period, signalling to the students to move on to the next table. Both the guests and the students were impressed with the high turnout, and often they were so engaged in conversation that they would run over 5 minutes. Our students were extremely grateful to all the guests for giving up their time to come along, especially as many travelled in straight from work, some even coming from Edinburgh to attend our event to help inform and inspire the next generation of the legal profession in Scotland. Among the guests from the prestigious firms and organisations were a large number of GCU graduates whom we were delighted to welcome back. Seeing what they have gone on to achieve in their careers was fantastic for our current students to give them a real sense of what is possible for them. Their success speaks volumes about the LLB at GCU, as does the fact that these former students were willing to return and spend the evening giving back to the current law students. One of these graduates was Gregg Scott, the GCU Law Clinic’s first ever student director, who came as a representative of Ashurt and their new Legal Analyst role, an alternative to practicing in the legal profession. Another was last year’s student director, Ian Laing, who came as the ‘Emeritus Director’. At last year’s networking event, Ian said, “I would be keen to come back and take part in this event in future once I have begun my own career,” and we were very grateful that he did. 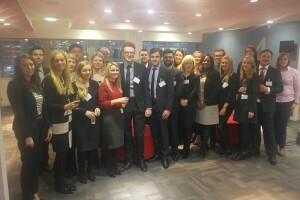 Our students found the evening both thought provoking and insightful having been able to make connections with people in a variety of different areas of law. 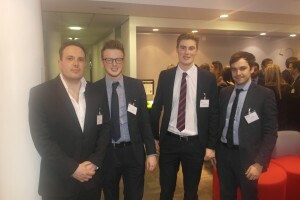 Some students were offered summer internships on the night and a handful of other students were encouraged by some of the large commercial firms to send them their CV’s for consideration for summer placements, proving this annual event to be a very valuable and successful night for our students and their experience and progression in their legal careers. 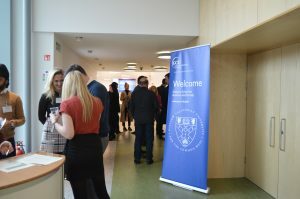 We would like to extend our thanks and gratitude to all invited guests who attended what is now our annual GCU Law Clinic Speed Networking Evening. 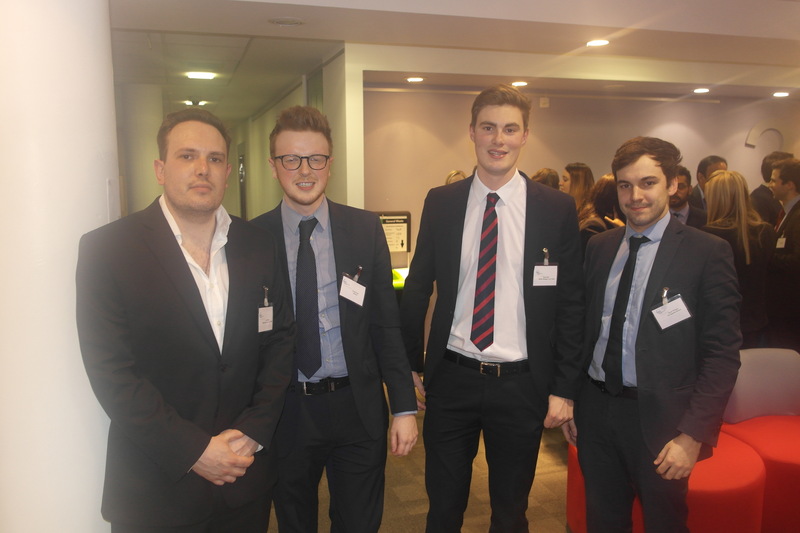 Thanks must also go to our students and lecturers who helped with the organisation of the evening and attended. We hope to see many of you again next year! As we approach the end of our second full year in operation we have dealt with over one hundred clients so far and have managed to either win or save those clients £8,600 in that time. We are continuously recruiting and training new volunteers enabling us to deal with a higher volume of cases going forward and this can only be a good thing for both our students who are able to put into practice what they are learning and for the Greater Glasgow Community. The numerous enquiries we deal with shows that the purpose we were established for, providing legal advice to those who do not qualify for legal aid and cannot afford a solicitor, is an endeavour which is necessary and allows people who have no other means, to access justice. The opportunities provided by the Law Clinic for putting these skills into practice were highlighted this year as one of our cases reached court for the first time. The first two students with the chance to see this through have been myself and our Media Manager, Ryan Bell. The court system can be intimidating to people who have no experience of it and our clients require representatives who are able to present their case in the most effective way. Despite the initial nerves, the advice and preparation we received from our supervising solicitors and the academics in the GCU Law department proved invaluable and we were able to achieve the result our client wanted. Ryan and I both had the opportunity to speak on behalf of the client in court across a number of visits from 7th January to 3rd May this year until we eventually won following a two-day proof. 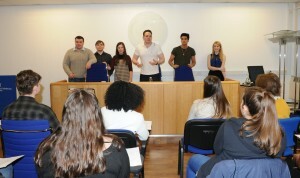 The opportunity to address a Sheriff in a real case, in front of an audience, which included experienced solicitors, present our argument utilising evidence we had compiled and question witnesses on the stand to both bolster our own argument and poke holes in that put forward by the defender is something the vast majority of law students don’t get to do. Helping a client navigate an unfamiliar and intimidating legal system is exactly what the Law Clinic was set up to do. One aspect of this case which was particularly pleasing is that it was referred to the Law Clinic by Ryan Watson, part of our founding management team who is now undertaking his traineeship with Livingstone Brown, the second largest legal aid firm in Scotland over the last year. Recognising that a claim of £3,700 would, even in a successful case, be offset by the substantial costs of instructing solicitors he referred the client to the Law Clinic. 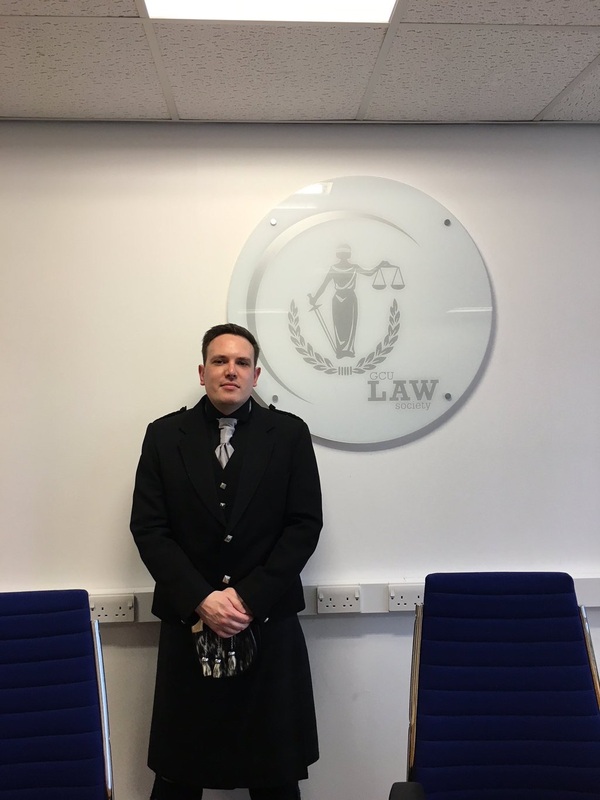 Building a network of partners within the legal community is something we are very keen to do and we are incredibly grateful to Ryan that he has retained his interest in the Law Clinic now that he has embarked upon his career. As more students gain experience via the Law Clinic I hope they will retain involvement and support our growth as they continue in their careers. “The work of The Law Clinic aids in accessing justice for our clients, because the clients who we see at the Law Clinic do not qualify for legal aid and cannot afford professional legal advice. Our work is crucial for those whose problems are of such small monetary value that hiring a solicitor is either impractical or impossible. One of the points which I wanted to highlight was that although the legal profession may regard certain illustrations of accessing justice to be slight (for example, as mentioned above, where the monetary value at stake is small) for our clients, the issue is incredibly important. Not only does the Law Clinic at GCU facilitate access to justice through its work, but the service is an embodiment of accessing justice in itself. The presence of any law clinic is testimony to that fact, as it is borne from the requirement of satisfying unmet legal need. The role of the state in providing access to justice in the UK has undergone considerable change in the last thirty years; moving from a publicly funded legal aid system that was regarded as one of the most generous in the world, to a rationalised provision that has seen significant reductions to both the scope of work that comes within legal aid schemes and the remuneration available to cover it, and that, as Law Clinics seek to fill that void, their presence and the service provided is an access to justice. Although being a part of the law clinic has certainly heightened my involvement with the department’s faculty and activities, and strengthened my legal knowledge and practical skills, my experience goes much deeper than that. I think it is fair to say that without the presence of our law clinic, some of our clients would have watched the life-line of their cases plateau, alongside experiencing the hope of achieving justice fade; highlighting just how imperative a service such as ours is in providing access to justice, especially to those who may have no other alternative. A lack of resource or at times even the governing legislation may impinge upon progress, and it is often necessary to look past the substantive law – to the more humanitarian angle of the case – in order to move forward. Listening to Patricia speak passionately about the human element to the case which can often be overlooked by people within the profession who, through the nature of business, look at the financial element above others I agree wholeheartedly with her assertions that without Law Clinics and the services they offer, many people would have no hope of seeing their case go anywhere and so the services offered by pro bono organisations are vital. 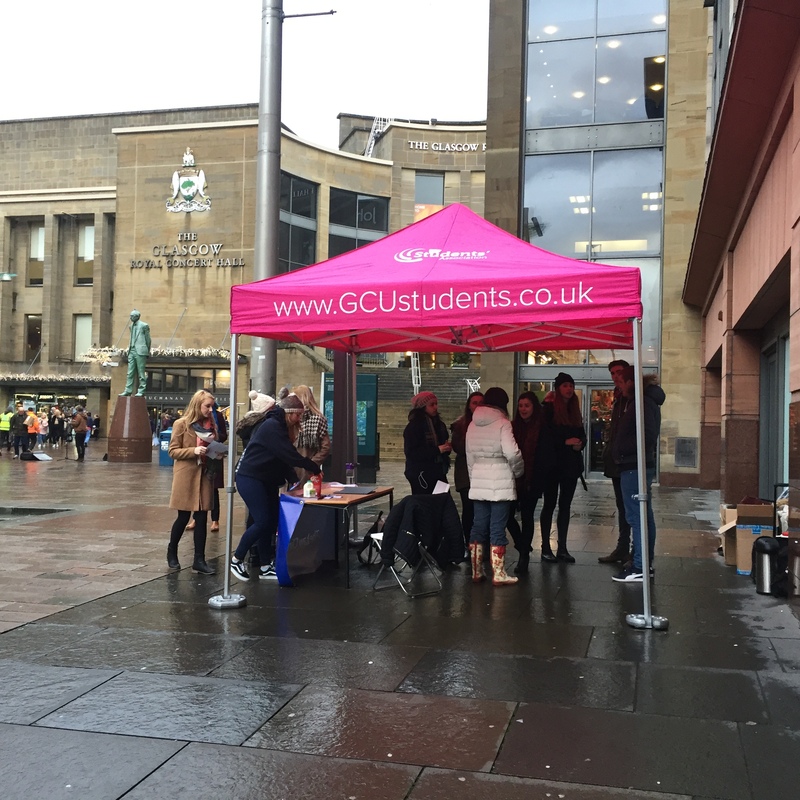 Raising awareness of the pro bono services we offer has been a major focus of the law clinic this year and December saw the Law Clinic team spend a day on Buchanan Street advertising our services to the public at the busiest shopping time of the year. The Christmas period is one which will see people purchasing and returning a huge volume of items and changes to consumer law in 2015 meant that people might not be completely aware of their rights in this arena. It is also a time of year when people in vulnerable situations can feel overwhelmed so a pro bono resource like the Law Clinic can be a lifeline. This was picked up by People Make Glasgow and highlighted in The Guardian which was great for all involved and especially for the profile of the Law Clinic. Our efforts regularly extend beyond our client work and our Outreach team are the perfect example of this. We have undertaken numerous Street Law sessions with high school pupils from across Glasgow and beyond including sessions both out at high schools as part of their regular lessons and on campus at GCU with students who have expressed an interest in studying law at university. 2016 has seen the work of the Law Clinic recognised with nominations for a variety of awards. 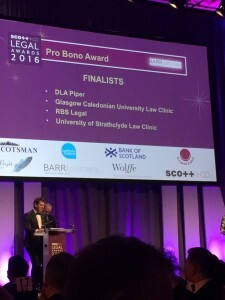 The most prominent of these was the Scott+Co Scottish Legal Awards in the Pro Bono Category. 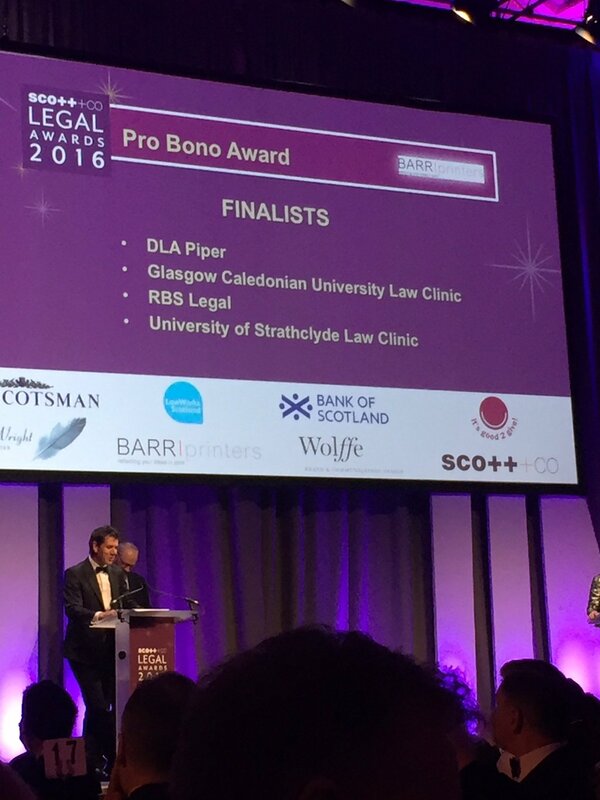 We didn’t win this year but to make it to the final four in the company of eventual winners, the University of Strathclyde Law Clinic, who have been running for the last 13 years, last year’s winners, multinational law firm DLA Piper and the RBS Legal team shows how far we have come in two years, with the awards ceremony taking place on 24th March, one week after our second anniversary on 17th March. We’ll hopefully be back in contention next year and bring home the trophy! 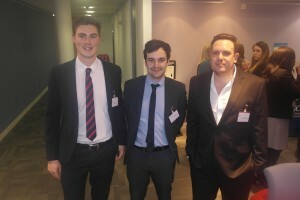 I was also honoured to be a finalist this year for the GCU Student of the Year Award in April. Again, no trophy but to make the final five in a university with thousands of students was humbling and although it was an individual award I wouldn’t have made the final five without the hard work put in by everyone who is involved with the Law Clinic. The GCU Student of the Year Award is given to someone who has made a contribution both to the university and the community and I could not have done anything to even be considered for this without the vehicle of the Law Clinic which is designed to make such a difference.. I have to thank everyone for that, it would have been an award shared by the whole team. 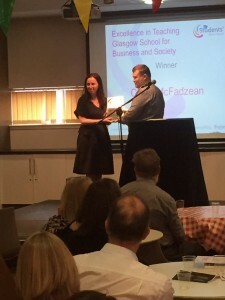 It was third time lucky during awards season however as in May our Academic Director, Claire McFadzean, was presented with the Excellence In Teaching Award for the Business School within the university by the GCU Students Association. This was in recognition of the opportunities Claire provides to all students who want to get involved with the Law Clinic and the fact she goes above and beyond with the help and guidance she provides to us. 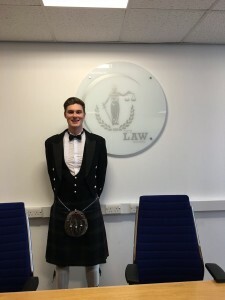 “Having held the inaugural Student Directorship at the GCU Law Clinic, I feel relatively well placed to provide some insight, and to issue a plea to students, as to the merits of volunteering at law clinics and pro bono ventures generally. Too often, as a result of the archetypal university mentality, it becomes easy to focus solely upon academic merit. Consideration of the bigger picture however, should always be at the forefront of our minds. As law students, we typically don’t get offered many opportunities for vocational learning and the benefits that follow on from this are hard to put into words. At a basic level, the level of independent legal-based interaction with real people with real world problems is unparalleled and the work really, really matters which gives it a significant edge over anything else. From a development standpoint, countless soft skills are honed and tested in the almost perfect ‘training environment’, eventually seamlessly merging into those necessary for thriving in a professional setting. Potential for a deeper involvement in the Clinic towards the latter years of the LLB opens up a whole other level of creative and professional development. Critically, the GCU Law Clinic is very much a living, breathing thing, and at all times reflects the values and efforts of the students running it. The opportunity to shape the Clinic based upon the needs of the people is one where you will struggle to experience anywhere else, and it is entirely the product of having a well-functioning, tight-knit law school (and particularly Claire McFadzean!). The knowledge and experience gained from working at the Clinic has undoubtedly served me well in life post-LLB. Since leaving, I have studied on the International Law and Security LLM at the University of Glasgow, graduating with distinction in November of 2015. I have also been fortunate enough to secure employment with Ashurst as a Legal Analyst in their Glasgow office, where I have undertaken pro bono work for a number of our leading charities clients and have taken a more than active role in promoting the work of law clinics and helping to grow the Ashurst Glasgow community efforts, with the firm recently being confirmed as a lead sponsor of the Law Society of Scotland’s Street Law initiative. The remainder of 2016 will see us launch a number of new ventures which will allow us to increase the number of clients that we are able to help. Holding the post of Student Director allows me to be involved in all aspects of the law clinic and I am able to see the hard work and enthusiasm of our team of volunteers on a daily basis. I have also been milking my 100% successful record in court for all it’s worth. 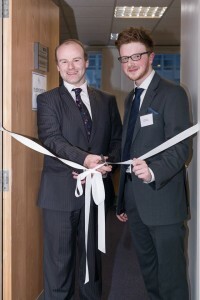 Volunteering with the law clinic has allowed me to supplement my studies in a very practical way and put into practice what I am learning while helping people who fall into the category of unmet legal need – which against the current backdrop of significant cuts to legal aid is continuing to grow. I cannot phrase it any more eloquently than our inaugural Student Director, Greg, and would like to echo his thoughts. 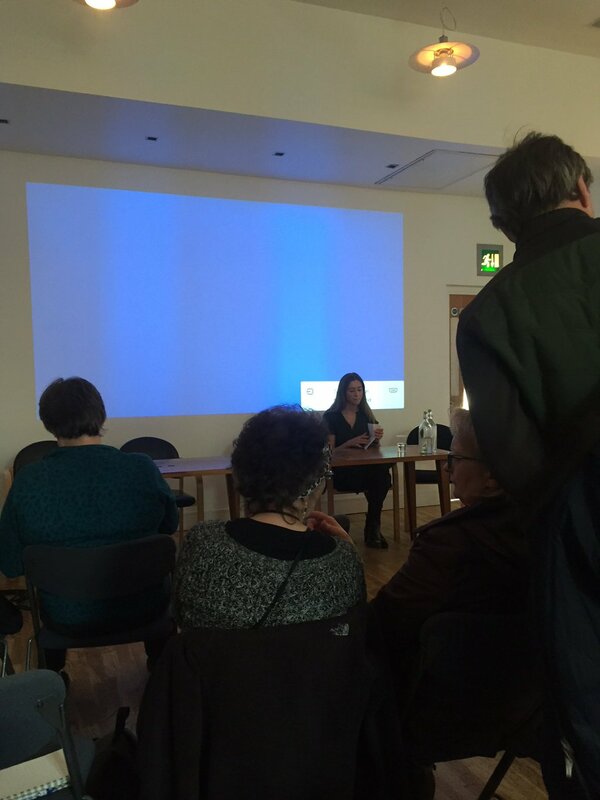 Studying at a university whose motto is ‘for the common weal’ and which aims to work towards the common good means we are well supported in our aims and expansion plans. Particularly, it is thanks to the supervision provided to us by our advisors, Sheridans Solicitors, which we are incredibly grateful for and especially the efforts of Claire McFadzean in establishing the Law Clinic and thanks to whom we are able to adopt a big picture approach to studying law and making a difference to those in society who need it most. Even though I am leaving GCU I am proud to have been asked to continue working with the Law Clinic in an as yet untitled advisory role in which I hope to be joined by a number of Law Clinic graduates over the next few years and I am looking forward to the chance to carry on helping us go from strength to strength, especially our hosting of the Scottish Universities Law Clinic Network annual conference at GCU in June 2017. My successor, Rachel, has been heavily involved in the Law Clinic in the last twelve months and has a very good management team appointed alongside her so the expansion plans we have will continue apace. I would like to thank the whole team for their hard work this year and especially Claire for the opportunity to hold this post over the last year. As her Excellence in Teaching award shows, the students working in the Law Clinic will be well supported in their efforts. Reflecting on the past year Claire said, “I am immensely proud of the achievements of the entire Law Clinic team during the last academic year. The motivation and drive of our LLB students has been truly amazing to witness. This article showcases some of the highlights from this year but I am all too aware that their individual and collective accomplishments go much further and deeper. Each day our law students demonstrate exceptional commitment and with their time and energy work incredibly hard in order to push forward with the work of the Law Clinic. Ashurst; Brodies; BTO; CMS; COPFS; Katani & Co; Livingstone Brown; MacRoberts; McCluskey Browne; McLean & Stewart; North Ayrshire Council; North Lanarkshire Council; Peacock Johnston; SCRA; SYLA and Whyte & Mackay. Most of the organisations represented are now employers of GCU Law graduates and our students were extremely grateful to all our guests who gave up their evening to speak about their careers in law and the many, varied opportunities open to students studying law. There was a real mix among the guests in both the sectors they worked in and the roles they perform. Being able to hear from experienced solicitors and trainees about their experiences in the profession, securing jobs within it and the lessons they learned during the job hunt was invaluable for our students about to embark on the same journey. We were also fortunate to have HR Partners join us and their tips on the application and interview process as well as what specific attributes their firms look for were very well received! Being able to have this interaction in a one to one conversation rather than across a stall at a packed careers fayre was a fantastic opportunity for the students. Our Academic Director Claire McFadzean was delighted by the turnout of employers, GCU graduates and students. “There is a real focus at GCU on the employability skills of our students. This is a key focus in the Law Clinic and on the modules ‘Skills for Legal Employment’ and ‘Professional Links’. It is vitally important in this competitive legal market that our students have well developed skills in client care, interviewing, negotiating and legal letter writing. 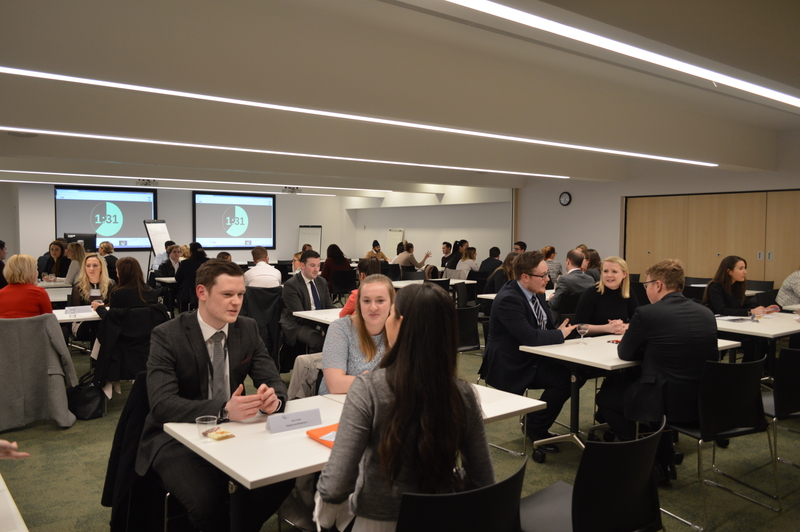 This networking event has allowed our law students to discuss their skill set and experience with professionals in the industry and allowed them to leave with greater knowledge on how to best move forward in developing and improving their CV. 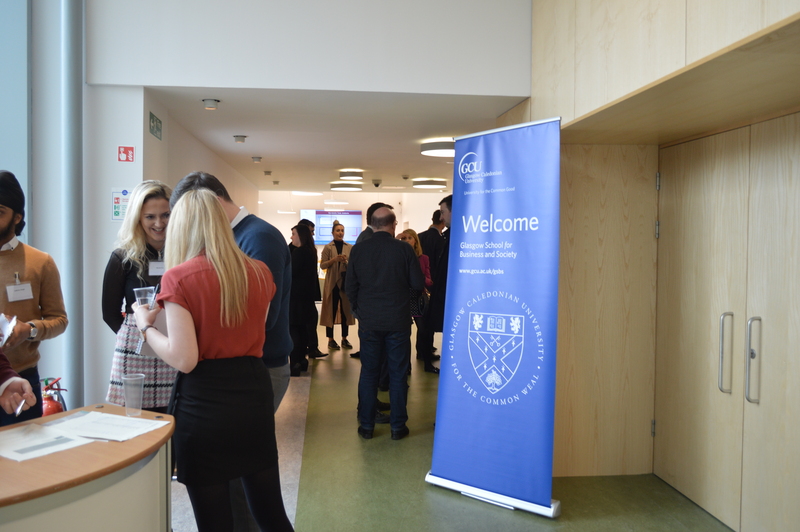 As well as welcoming guests from so many prestigious firms and organisations we were very happy to welcome back among them a large number of GCU graduates. Seeing what they have gone on to achieve in their careers was fantastic for our current students and gave them a real sense of what is possible for them. 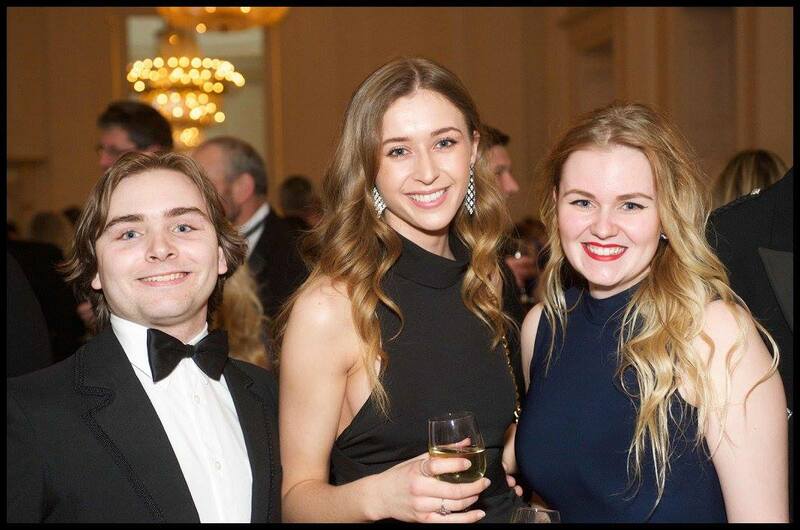 Seeing how well they are doing speaks volumes about the LLB at GCU as does the fact that these former students were willing to return and spend the evening giving back to the current law students at GCU, Indeed, Hazel Langan, one of our LLB graduates is now a Partner at McLean & Stewart. 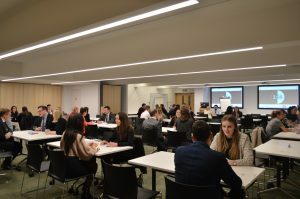 The broad range of career paths showcased on the night included both traditional careers in law and roles that students may not initially have considered when beginning their legal education. 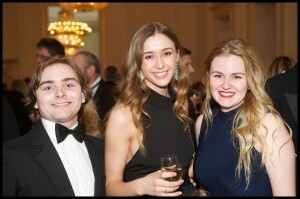 Guests on the night came from a wide variety of roles within the profession including among others, a Partner in a high street firm, a Procurator Fiscal and in-house solicitors with local authorities and drinks giant Whyte & Mackay. New legal careers such as the Legal Technologist role pioneered by Ashurst were highlighted along with the opportunities afforded by this role such as working abroad in one of their many international offices. 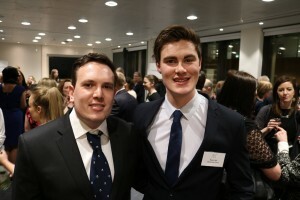 Representatives were also present from the Scottish Young Lawyers Association, membership of which provides many benefits to those beginning their legal careers, even at the university stage. Our Student Director Ian Laing spoke of the benefits of membership of SYLA and said, “At the beginning of May I was able to attend a talk given by a former lawyer of both FIFA and FC Barcelona free of charge courtesy of SYLA.” For students looking to further their studies there were guests who have embarked upon Masters degrees and Doctorates in law to talk about their experiences in academia beyond the LLB. The night was styled as a ‘Speed Networking Evening’ and used a speed dating format to make sure that all of our students got the chance to speak to each of the guests. Every five minutes a bell would ring and the students would move on to the next table. The event ended up running over time with people slow to move on when the bell rang but this was due to everyone enjoying the evening and nobody was in a rush to wrap it up at the end. This showed how much of a success the event was from the point of view of the students who all thoroughly enjoyed it and also highlighted how generous the guests were with their time. They had all come from work, some from Edinburgh and Dunblane, to the event yet nobody was desperate to leave. We are incredibly grateful to all the guests who joined us and helped to inform and inspire the next generation of the legal profession in Scotland. 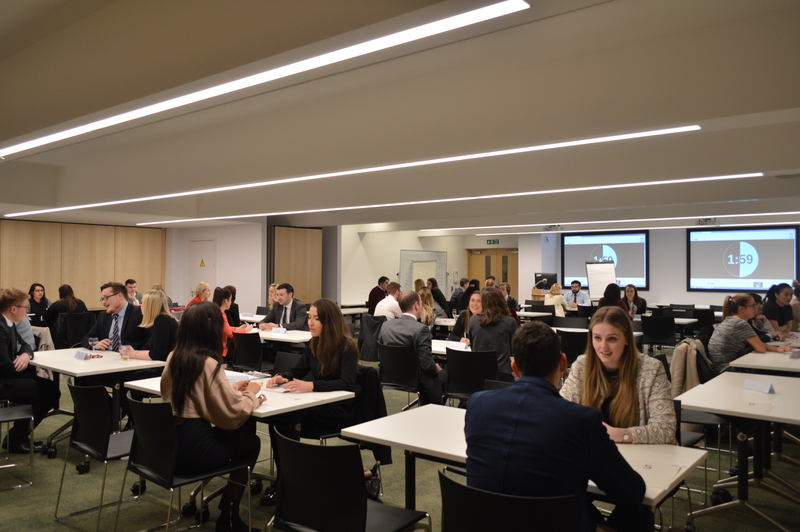 We would like to extend our thanks and gratitude to all who attended, both invited guests and students for what we hope is the first annual GCU Law Clinic Speed Networking Evening. Thanks must also go to Patrick Ring who helped with the organisation of the evening and especially to James Connolly and Andrew Tickell, lecturers in Law at GCU for footing the bill for the wine. Everyone definitely appreciated that! A full gallery of pictures from the event taken by Joe Beaver on behalf of GCU Visual can be found here.